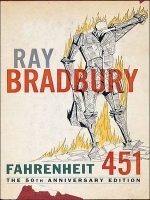 Fahrenheit 451 has been on my list to listen to for some time now. It just so happens that this turned out to be “Banned Books Week”. How serendipitous is that? I recently listened to The Martian Chronicles and immediately noticed it was the same narrator, Stephen Hoye. His voice seems to pair well with the classic nature of both of these novels. There’s an old-timey feel to it, and the tone of his voice is perfect to express the melancholy feel ever so prevalent in Fahrenheit 451. To be honest, all I really knew about the novel was that books were burned, and that this was classic that everyone should read as a cautionary tale. There are many layers to it other than the book burning though. It’s not just about burning the books. What do they represent? Knowledge begets jealousy. Undeniably some people have more time or ambition to seek out knowledge than others. Why not control what knowledge there is to consume so everyone is equal and people are happier, right? Without books, what is left? There are still publications like comic books and magazines, but nothing of real substance. Interactive media through “parlor walls” (full wall video screen) is prevalent, and the main character’s wife is hopelessly addicted. They have just installed a 3rd wall (not yet paid off) and she’s anxious to get a 4th to be able to be completely immersed in the experience. She uses these to participate in interactive stories where she reads lines. When not immersed in her parlor walls, she doesn’t spend much time interacting with her husband. She also wears “seashell ear-thimbles” (earbuds) to continue her media absorption all way way up until falling asleep, and probably while sleeping too! I won’t expand any more on the plot. There are plenty of summaries out there to reference. What I’d like to stress is that the audio version, specifically the performance by Stephen Hoye, would be a good experience to have in addition to reading the actual book. I’m sure those that have read this likely did back in high school or many years ago. Stephen Hoye really does bring the words to life and does enough character voice differentiation to make it really feel like an audio drama, not just someone reading a book. The book is only about 5 hours, so for most people you’d be able to consume it in just a week or so of commuting to and from work! This is likely available free if your library participates in Overdrive. Be sure to get the 50th Anniversary Edition. I’m finding that after just two books, I’m really liking Ray Bradbury as an author. He has a way of describing just about anything and making it beautiful and relatable. If you haven’t read anything by him, this is a good one to start with. It is arguably his best work, however I can’t really pick between this and the Martian Chronicles. They are both great.